More Idaho ranchers are getting involved in range monitoring than ever before. Ranchers understand that it’s important to document rangeland conditions on a consistent basis and provide the Bureau of Land Management with relevant data on rangeland health. But many of them didn’t necessarily know how to monitor rangelands effectively until a new program came along to provide education, field training and BLM protocols to follow. A group of ranchers work together to set up a landscape photograph at a BLM photo point during a range monitoring workshop in Oreana while Life on the Range videographer Chris Ennis documents the story. Tony and Brenda Richards, who run cattle in the Owyhee Mountains, are two of more than 100 ranchers in southern Idaho who are jumping on board this year. “We look at this as an investment in keeping our business healthy and thriving, and keeping the resource healthy and thriving,” said Brenda Richards, who also chairs the Owyhee Ini-tiative Committee and is president of the national Public Lands Council. Jason Nettleton, who also ranches in the Owyhees, says it’s great to put more attention on range monitoring and management. 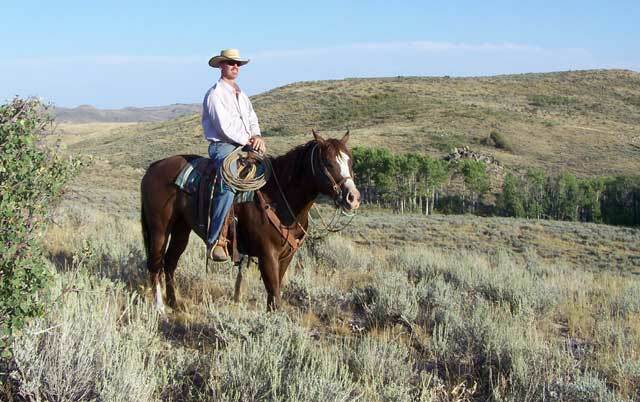 “I think every rancher does that as a steward of the land. First, and foremost, I don’t consider myself a rancher. I consider myself as a vegetation monitor because really, we’re not raising cows, we’re raising grass. We use the cows to harvest that. 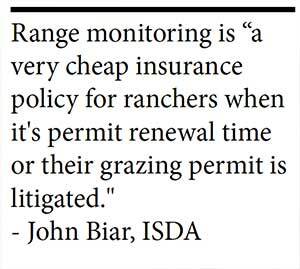 The new range monitoring program is a cooperative effort by the Idaho State Department of Agriculture, the Bureau of Land Management, University of Idaho Extension Service, University of Idaho Rangeland Center, and the Idaho Rangeland Resource Commission. A Memorandum of Understanding between ISDA and the BLM sets the protocols on how to gather monitoring data so the information is readily accepted by the BLM. 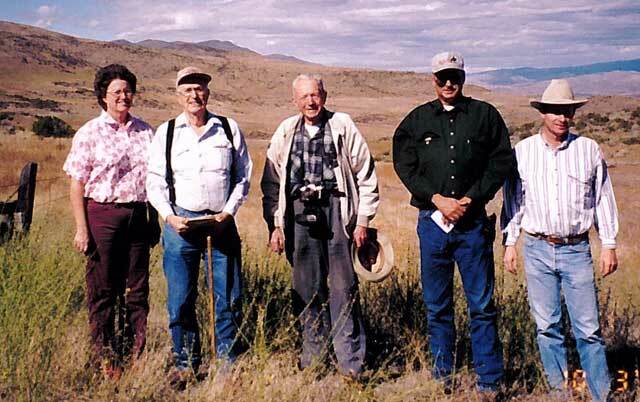 Gus Hormay, center, worked with the Little family to set up photo-monitoring points on their ranch as part of a rest-rotation grazing system. From left, Judy Hinman, David Little, Hormay, Jim Little and Brad Little. “It is a gift to the future,” Jim Little says. Under the new program, 27 photo points were taken on 125,000 acres of public rangeland in 2014. This year, at least 135 photo points are being taken on 300,000 acres of public rangeland. Amanda Gearhart taught 14 range-monitoring educational workshops across southern Idaho last spring, from Idaho Falls to Marsing. About 100 ranchers attended, plus an equal number of BLM, Forest Service and Idaho Department of Lands employees. The workshops feature classroom and field sessions to teach people how to gather photo and plant monitoring data. Then, as a follow up, experts from Idaho State Department of Agriculture help ranchers get started with photo-monitoring on a one-to-one basis in the field, using the protocols agreed upon by the BLM and ISDA. Hyde grew up on a ranch in Emmett, where range monitoring photo points were set up long ago. “Back in the 70s, my grandfather worked with Gus Hormay to set up a rest-rotation system, and at the same time, a monitoring program,” Hyde explains. “Over the years, having that data, having those photos, we were able to impact some of the decision-making, because we knew more about how things were being impacted in a positive way. A key advantage for ranchers to get involved is that the data they gather will supplement existing photo data and notes in BLM files. MOU protocols call for photo-monitoring data to be collected in the same location at the same time each year for continuity. BLM photo points already have been established in most areas. John Biar, who recently retired from ISDA, was a key partner in creating the new range monitoring program. 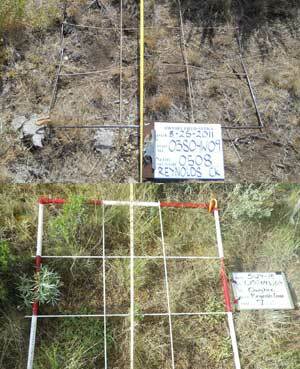 The range monitoring protocols call for using a 3-foot by 3-foot frame to collect information about range plants growing inside the frame. “What we wanted to do was find a tool that we could help the federal agencies with, in getting good monitoring data that would support the BLM and help in grazing permit renewal decisions,” Biar said. Nika Lepak, a Rangeland Management Specialist in the BLM State Office, said, “The MOU is valuable for BLM because we know that when a permittee is working with ISDA that they’re following all the correct protocols for completing photo monitoring, and we know that they’re doing that work over the lifespan of the grazing permit. The range monitoring workshops explain the BLM protocols in the classroom and the field. But before Amanda Gearhart goes into that detail, she explains what range monitoring is, and why it’s important at a workshop in Oreana in Owyhee County. “Monitoring is defined as the orderly, repeated collection, analysis and interpretation of resource information. It is designed to detect change over time,” she says. Indeed, photo monitoring tells a story about the land over time. It also shows how changing weather conditions or livestock management may affect the land over time. Owyhee County Rancher Tony Richards sees a lot of value in documenting those changes. Take landscape photos from existing BLM photo points from several different directions. Fill out a photo board with pertinent information prior to taking the landscape photos. Place a 3-foot-square frame on the ground, and take a close-up photo of the vegetation in the frame. Tony Richards, top, and Brenda Richards above, both say that range monitoring is important to track management goals and how grazing is affecting the land over time. Locating the existing BLM photo points can be most challenging, even with the GPS coordinates. 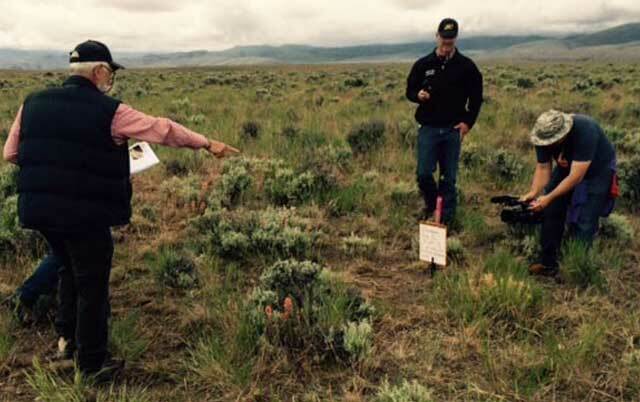 At the Oreana field workshop, several groups had difficulty finding BLM yellow or orange markers on the ground in a sea of sagebrush. But once they found the spot, they set up the photo monitoring picture. They used previous BLM monitoring photos to orient the photo in the same direction. 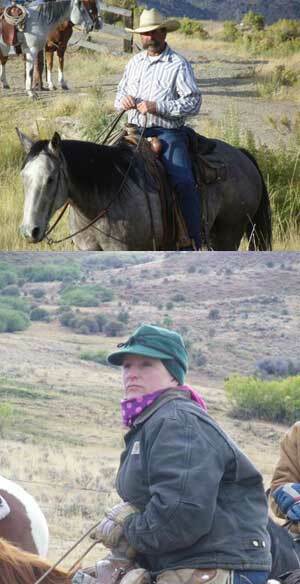 Upon request, Jacobson goes out and assists ranchers in gathering monitoring data for the first time on BLM grazing allotments to walk them through the process. She’s been working with Tony and Brenda Richards to get their field work completed. “It’s kind of a good place to crack the door, come in, go through their files, and see what’s in there, and understand how it relates to the conditions on their grazing allotment,” says Nika Lepak. “It’s going to be beneficial to the BLM because they have a tremendous workload,” Brenda Richards says. “So with this program, it’s a true partnership that is actually something on the ground, helping the resource and the businesses out here.